We have 37 members in our club this year. They take a total of 27 different projects. Members exhibit their projects at the Rock County 4-H Fair in Janesville, WI. We have many club activities during the year. Some of our activities include ice skating, glo-bowling, hall grounds clean-up and weiner roast, club picnic and Annual Awards night. 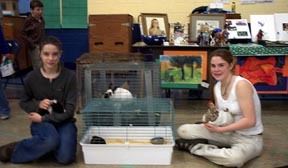 We also take part in many county 4-H activities; such as the fair, Jr. Council, volleyball, basketball, and soft ball. Our members also do several community service projects each year.